This week, Franco gets injured, but he doesn't have health insurance. 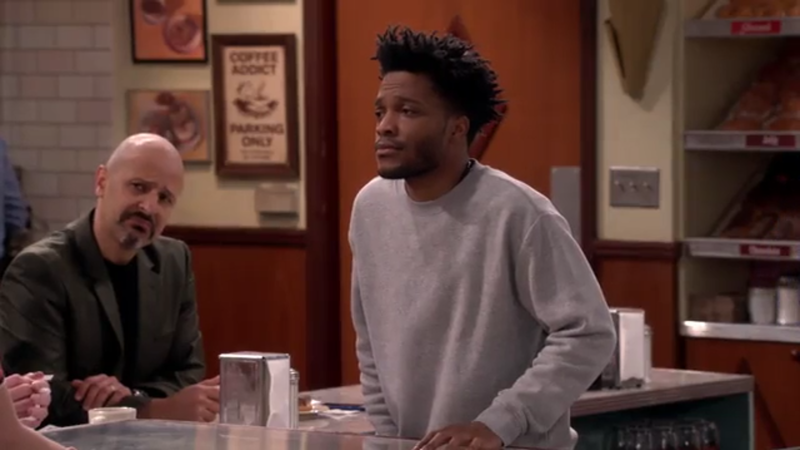 S1E8 "Man Without a Health Plan"
The episode begins with the Superior Donuts sign having been changed to say Super nuts. Randy reminisces about her pranking days, and it's funny when Jimmy brings up that she pranked him yesterday. Franco goes to fix the sign, and ends up twisting his ankle. Franco explains how he never went to the doctor while growing up, and Maya has a funny line about what his therapist said about that. Jim O'Heir makes a very funny guest appearance, that includes references to his Parks and Recreation role of Jerry, as someone Arthur called to help out Franco, but it turns out that he can't when Franco can't take a drug test. Maya decides to raise money to help Franco, and everyone else at Superior Donuts chips in. There is a hilarious line here when Arthur says that yesterday he made a lot of money off of stress eating because the president made a speech. However, Franco doesn't want their help, and he attempts to make an exit. The next day, Franco comes into work using a bike to help him walk, which makes his job difficult to do. It is very funny when Arthur hurts his back, and Franco tries to help him out, which leads to them both falling onto the ground. Randy calls an ambulance, but Arthur and Franco are both too stubborn. So, Randy convinces them to go to the hospital to get the other one to. The old man worries about being old story has been done a million times before, but at least it wasn't given too much attention, and they did it fairly well. There were quite a few good jokes here, and Randy was funny as always, though my favorite scene was the one with Jim O'Hier. What did you think of "Man Without a Health Plan"? Leave your thoughts in the comments!